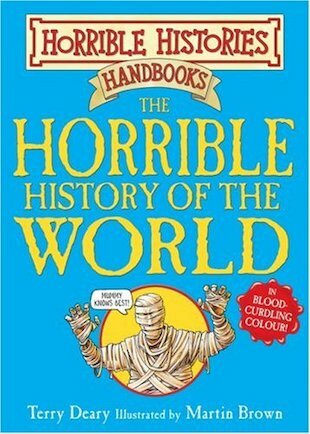 Every horrid bit of history you ever wanted to know – in a handy pocket-size. Now all the nasty bits are at your fingertips! From brain-nibbling Neanderthals to the terrifying 20th Century, discover heaps of horrid facts to make you laugh your socks off. Want to know: why Alexander the Great banned beards? What smelly sport the Samurai warriors played? Who tried to bump off her enemies with a cake made with poisoned bath-water? It’s got all the wickedness of the world – with the gore and more! 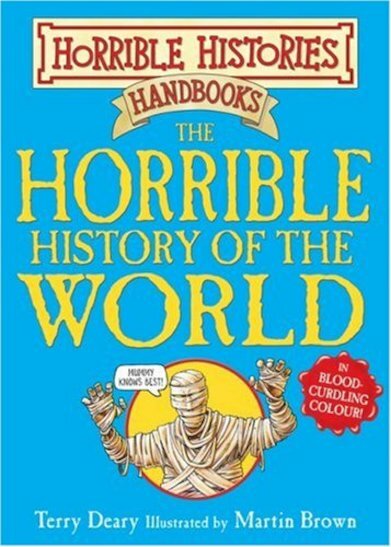 Horrible Histories Handbooks: The Horrible History of the World, in “blood-curdling color!” A must for all who love to learn about the gory side of history! if you go to gasington school me and my freind molly are doing a horrible history club and we love horrible histoies and hope you historians will like it and the book i loved it p.s the school is in england and i have not read the book yet but i think it is amazing can not wait to buy and read it!!!!!! this book is great not only is it funny but it helps with school projects.